For a complicated network of reasons in Parkinsonâ€™s — genetics, environmental exposure, inflammation â€“ brain cells that produce dopamine are dying, leading to classic motor symptoms as well as others such as disturbances in smell, sleep, digestion and mood. Neurologists now treat Parkinsonâ€™s disease with drugs that help the remaining dopamine-producing cells produce more dopamine or substitute for it. But having dopamine floating around inside cells is actually stressful for them. The dopamine is unstable and can damage the cell’s machinery. This partly explains why dopamine-producing cells are more vulnerable to toxins. Millerâ€™s team at Rollins School of Public Health has been studying a protein called VMAT2. ItÂ packages dopamine (and other neurotransmitters) into vesicles, membrane-clothed bags. 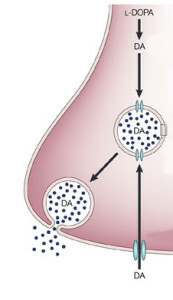 The vesicles sequester the dopamine in a safe container before it is spritzed outside to do its job of signaling to other brain cells. Not having enough VMAT2 leads to a Parkinsonâ€™s-like condition in mice. But until this paper, with co-first authorsÂ Neuroscience program graduate student Kelly Lohr and postdoc Alison Bernstein, nobody had looked at what happens if mice are forced to make more VMAT2 than usual. As one might predict, brain cells from mice with an extra VMAT2 gene take up more dopamine and package it better. Their vesicles are larger. The authors write thatÂ they hypothesized that the mice would display increased anxiety-like or mania-like behaviors, but this didnâ€™t turn out to be the case. The mice that make extra VMAT2 were more resistant to MPTP, a toxin that is often used to produce a model of Parkinsonâ€™s disease. Thatâ€™s good news, but in this experiment, the protective treatment (growing up with an extra VMAT2 gene) came before the neurotoxic damage induced by MPTP. A more strenuousÂ test would be asking whether somehow inducing VMAT2 after MPTP exposure can mitigate its effects. People who make more VMAT2, because of variation in the VMAT2 gene, appear to have less risk of developing Parkinsonâ€™s. And a recent paper shows that VMAT2 function is impaired in tissue samples from Parkinson’s patients. What is now needed is a convenient way to spur human brain cells to visit the Container Store: that is, stimulate VMAT2 function or make more VMAT2. “If only it were as easy as going to the store,” Miller quips.